Across Canada, Anglicans are supporting interim solutions for safe and accessible water in the First Nations community of Pikangikum, Ontario, through PWRDF. Give towards a living gift: clean water! Join a national movement to ensure everyone in Canada has access to clean water. Watch this small sacrifice multiply into Christ’s True Presence: water and life. Pikangikum is a First Nations community in northwestern Ontario. It came to national attention after a wave of youth suicides in 2011. The tragedy prompted a group of Toronto-based professionals to work with the Pikangikum elders and school system. This group (called the Pikangikum Working Group) identified 12 priorities for the community. The first priority was to get a new school, which opened in the fall of 2016. The second is clean water. For video about the work in Pikangikum Working Group, visit the water4all website. Of the 450 homes in the community, 415 (90%+) do not have water or waste-water services. Surface water sources (lakes and rivers) are vulnerable to contamination, as are in-home water storage systems. Inadequate and decrepit wooden outhouses are used by most residents. Most of the present homes do not have the space or the structural integrity to support bathroom facilities. To provide a source of potable drinking water to Pikangikum homes, equipping the homes with a cistern to hold the water and a wastewater holding tank, as well as the necessary fixtures and fittings. Since 2013, more than $600,000 has been raised and 24 homes equipped with clean water and waste water removal facilities and the skills/labour training and jobs that go with the system. 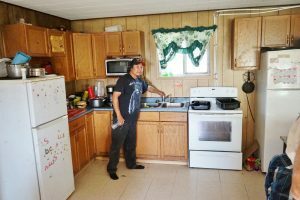 Families of Pikangikum, mostly elderly and with extreme health constraints, express relief and happiness in having access to clean water, toilets and bathing facilities at home. The Primate’s World Relief and Development Fund has been working with implementing partner Habitat for Humanity Manitoba since 2016 and continues to accept donations for additional work in Pikangikum or other communities in need. Bishop Mark MacDonald, the National Indigenous Anglican Bishop of Canada, has brought a group of representatives together from churches and community groups with interests in the Indigenous communities in Canada. The group was initiated because there were concerns from many of Bishop Mark’s contacts regarding the lack of good drinking water in First Nations’ communities and how ordinary Canadians could affect change. Bishop Mark’s group, now known as Pimatisiwin Nipi (“Living Water”) Group, supports PWRDF’s water program in Pikangikum as it works to achieve the Four Pillars in their work together: Advocacy, Education, Partnership, and Strategic Giving. Pimatisiwin Nipi supported PWRDF’s water program in Pikangikum. Like and follow Pimatisiwin Nipi on Facebook. Online then choose Indigenous Communities (#6) from the drop down menu and specify Pikangikum where indicated. Call Jennifer Brown at PWRDF at 416-924-9192 ext. 355 or 1-866-308-7973. In cases where donations exceed what is needed or where local conditions prevent program implementation, PWRDF will redirect funds to similar activities to help people in need. One percent of designated funds will be set aside for program monitoring and evaluation costs.